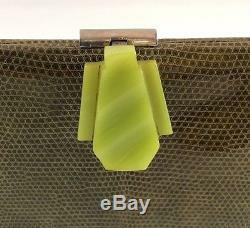 Art Deco Green Snakeskin Handbag with Bakelite Clasp Silk & Kid Lined. 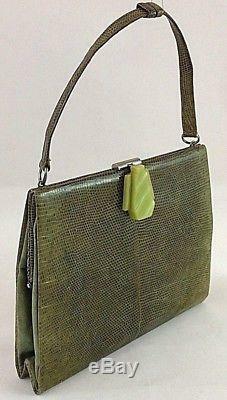 Exquisite Art Deco Green Snakeskin Handbag with a Stunning Jade look Bakelite Clasp and Silver coloured Metalwork. 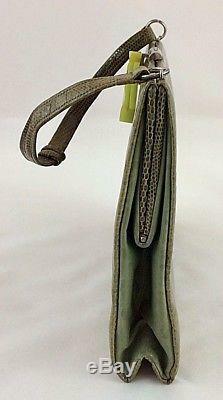 The Traditional Shaped Handbag boasts a classic Art Deco Streamline design: in Real Snake Skin, a Bakelite finished Lift Clasp Fastening, Matching Snake hand strap, fully lined Silk interior with a single open pocket and a clasp fastening integrated Coin Purse that is lined in an Ivory kid leather. The Snakeskin has been coloured to a beautiful Soft Moss Green, its always hard to describe colour as its so objective and all computer monitors will show different shades, but this is a beautiful soft green with exceptional skin marking with great dark and light toning. 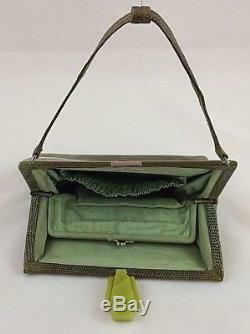 Exotic Skin Art Deco Handbags are one of the most desirable and collectable of the vintage handbags, this desirability reflects their craftsmanship and beauty, especially with archetypal Deco Design. 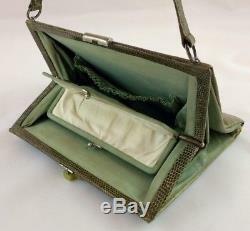 Eye-catching, Useful, & certainly Decorative, the Bag will add to any Vintage Enthusiasts Collection. 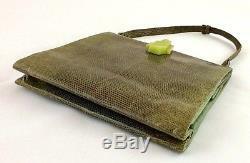 Bag is in very Good Vintage Condition for its age, material, and obvious use. There is little discolouration and fading to the external body and the skin is crack and split free. There is very light scuffing to the base of the bag and a 0.75cm pen mark to the bottom front edge, which should clean with professional help. The internal Silk lining is whole. And in the main stain free, there are some small amounts of discolouration, in keeping with age and general use. 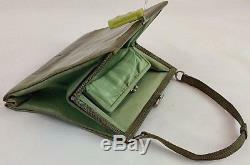 The Coin purse is in full working order, the soft Kid lining is a little marked and has some tiny wear holes at its base. 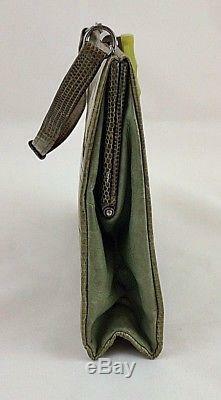 The hand strap is whole, with little ware and secure. 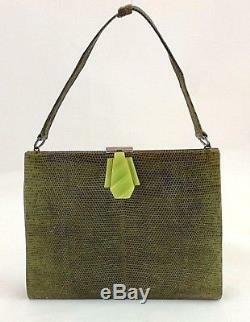 This is a truly Beautiful bag with a Great Deco look. Please note that in the fourth image, there is a light patch in the top right of the bag, this is just the lighting in the photograph and not a mark on the skin. Overall Measurements: Height 16.5 x Width 20 x Depth 3 cm. Long 28 cm x Width 1.25 x Depth 0.5 cm. Height 4.5 x Width 3.45 x Depth 1 cm. 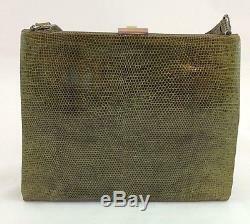 The Bag is in very Good Vintage Condition for its age, material, and obvious use. The internal Silk lining is whole, and in the main stain free, there are some small amounts of discolouration, in keeping with age and general use. 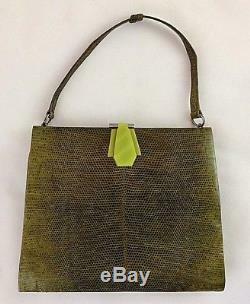 The item "Art Deco Green Snakeskin Handbag with Bakelite Clasp Silk & Kid Lined" is in sale since Monday, April 02, 2018. 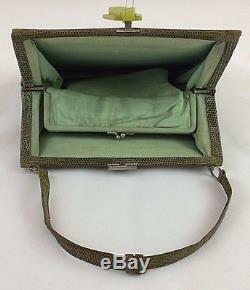 This item is in the category "Clothes, Shoes & Accessories\Vintage Clothing & Accessories\Vintage Accessories\Bags, Handbags & Cases". The seller is "surreyhomestores" and is located in New Maldon, Surrey. This item can be shipped to United Kingdom, Austria, Belgium, Bulgaria, Croatia, Cyprus, Czech republic, Denmark, Estonia, Finland, France, Germany, Greece, Hungary, Ireland, Italy, Latvia, Lithuania, Luxembourg, Malta, Netherlands, Poland, Portugal, Romania, Slovakia, Slovenia, Spain, Sweden, Australia, United States, Russian federation, Canada, Brazil, Japan, New Zealand, Israel, Hong Kong, Norway, Indonesia, Malaysia, Mexico, Singapore, South Korea, Switzerland, Taiwan, Thailand, Chile.